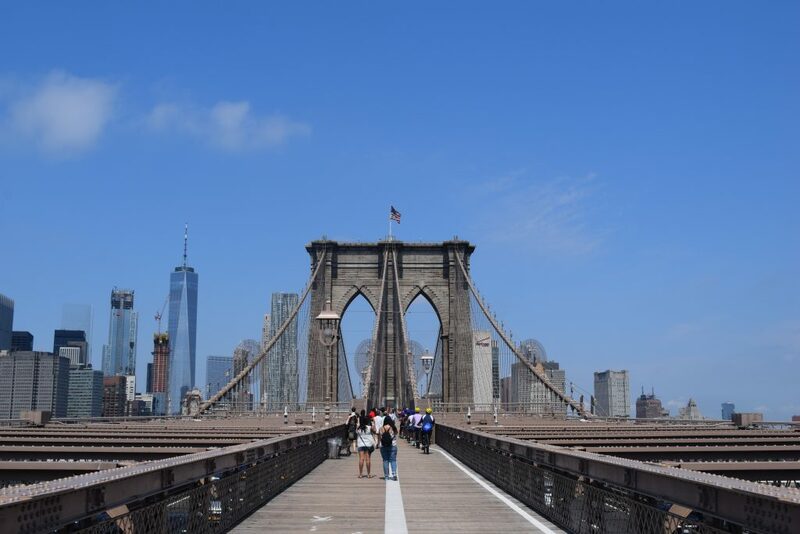 The Brooklyn Bridge is an iconic sight in New York, but is it suitable for little legs? 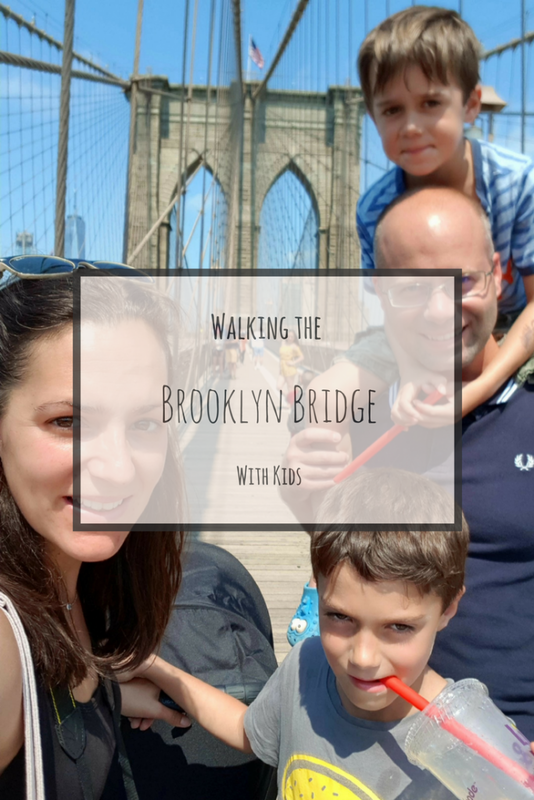 Read all about our experience of, and our tips for, walking the Brooklyn Bridge with kids. 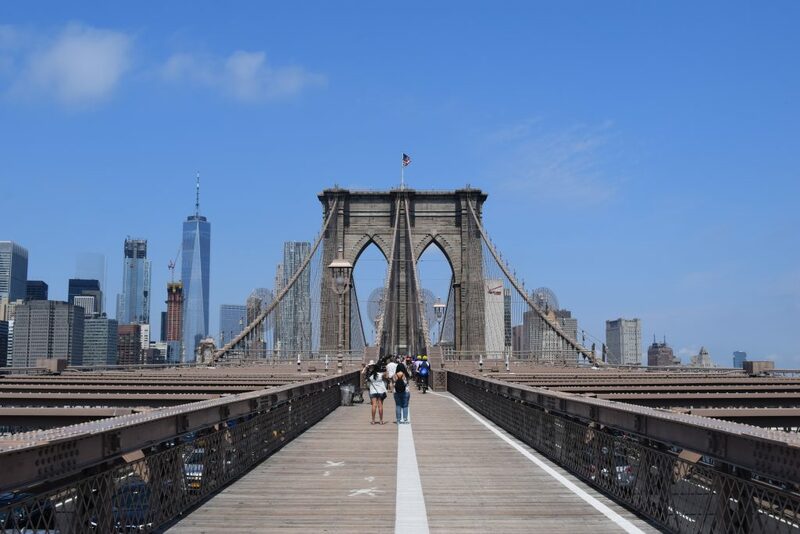 During our recent visit to New York City, I managed to tick off one of my bucket list experiences; walking over the Brooklyn Bridge! And what’s more, I did it with three little people in tow too. At 1.3 miles long, and very popular and busy, it’s not the easiest walk to do with younger kids. But we conquered it; and what’s more we all had a fab time! The kids are now so proud to say they have walked it, and I am super pleased too. 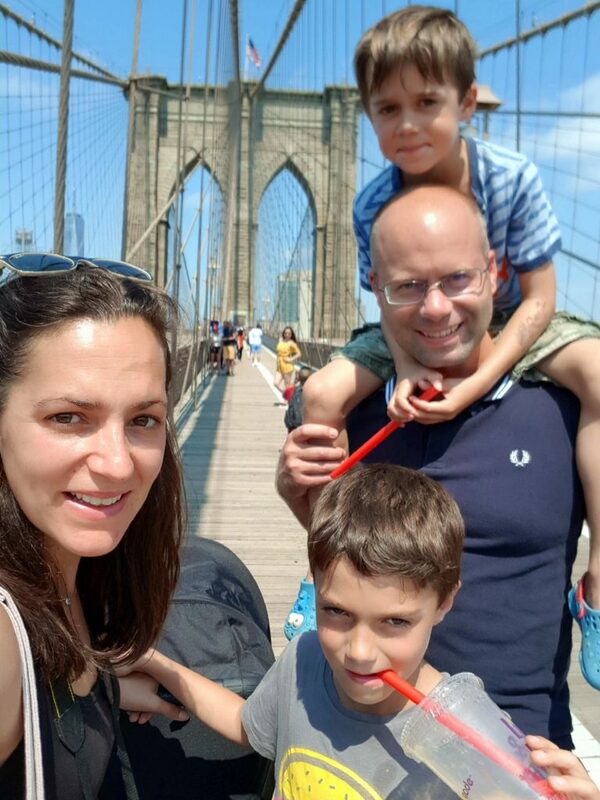 Here are my top five tips for a successful walk across the bridge. 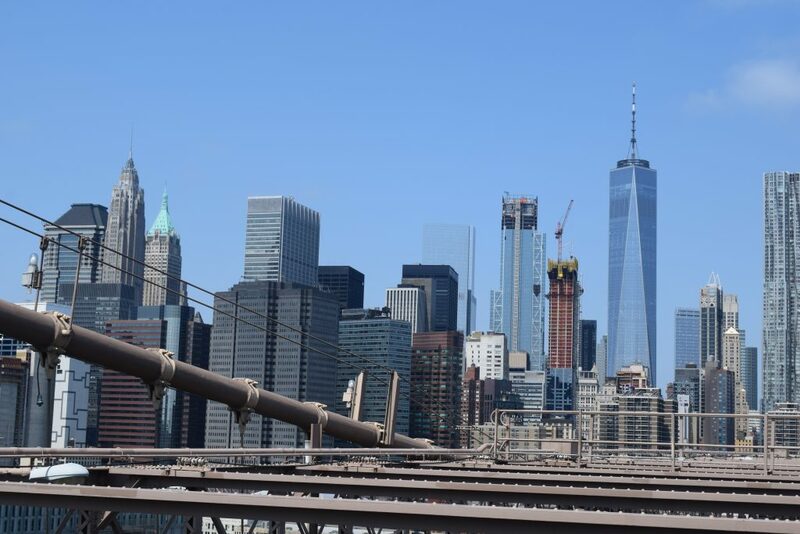 We started our walk from the Brooklyn side, heading towards Manhattan, and as we were already in Greenpoint in Brooklyn that morning we jumped on the East River Ferry down to the stop at Dumbo. The ferry took us under the bridge, excitement building that we would soon be up there! 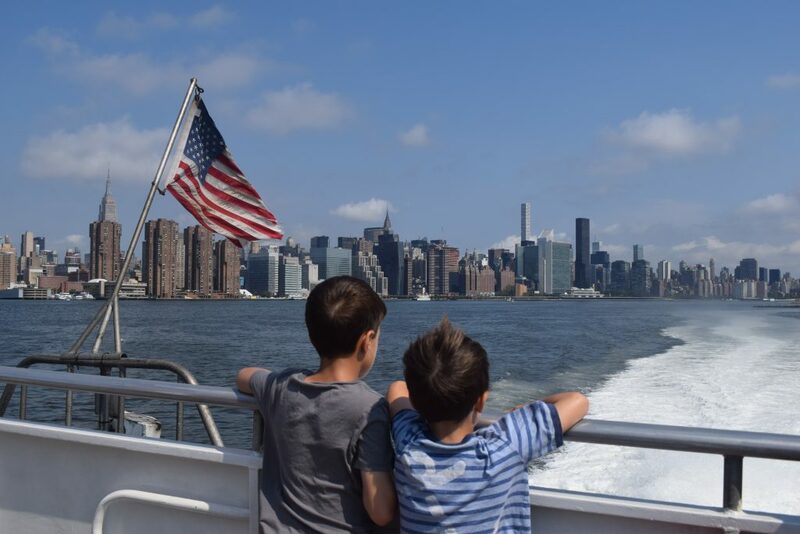 It was also an absolute pleasure to see the boys faces when they spotted the Statue of Liberty for the first time as we raced down the East River. Before heading up on to the bridge, we let the kids have some time to play in the playground. 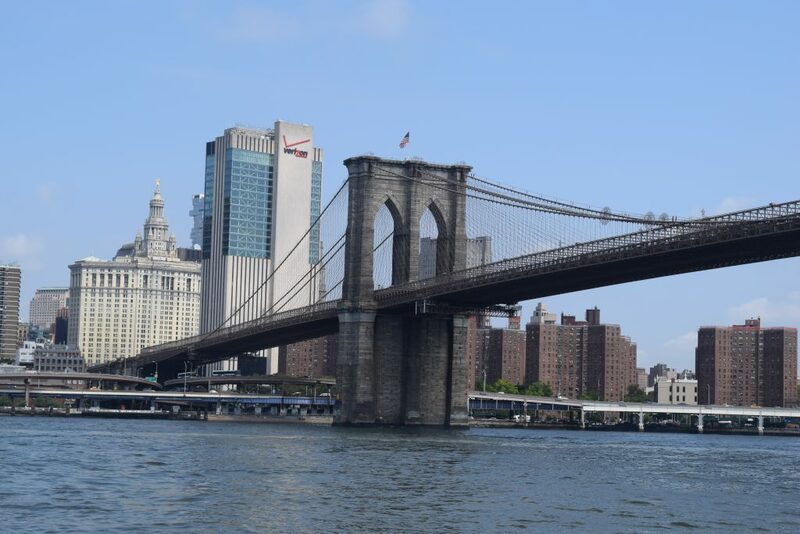 This is also great as a reward if you’re walking the bridge from Manhattan to Brooklyn. It was a very hot day on the day we walked, so we found a fresh lemonade stand and grabbed a nice cold drink to start our walk with. I was so grateful that we did as there was little shade and it was hot work, the lemonade was just perfect to cool us down. On the Manhattan side of the bridge there were some street vendors selling cold bottles of water, but nothing on the bridge so it’s a good idea be prepared. If you’re walking during colder months, then I imagine it would be lovely to have a nice warm take out coffee or hot chocolate to warm you up along the way! Stay away from the bike lane! The walkway over the bridge keeps you safely away from the busy road beneath, but it’s a shared walkway between pedestrians and cycles. I noticed quite quickly that cyclists weren’t slowly trundling along, taking in the views like us; there were some seriously fast cyclists flying across the bridge taking no prisoners! They will not slow down and will shout at you to move, so make sure you stick to your lane and keep little ones from straying over the white line too. 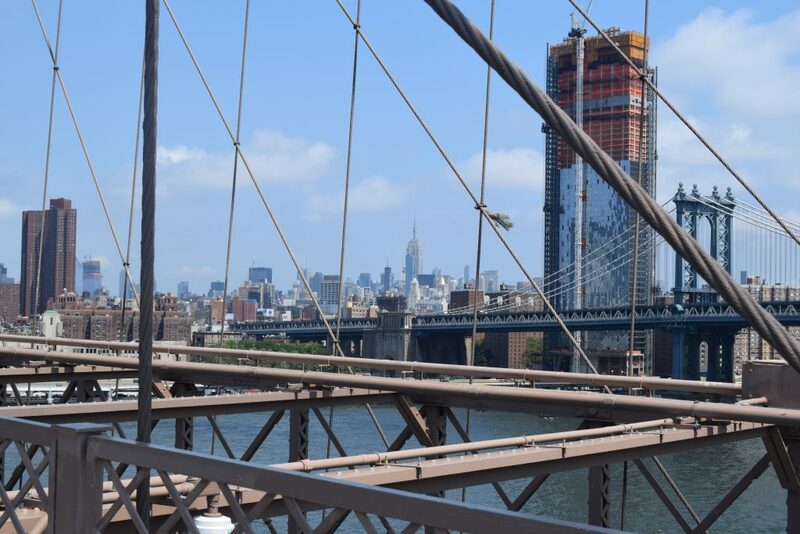 Walking from Brooklyn to Manhattan, as we did, affords you some amazing views of the city. 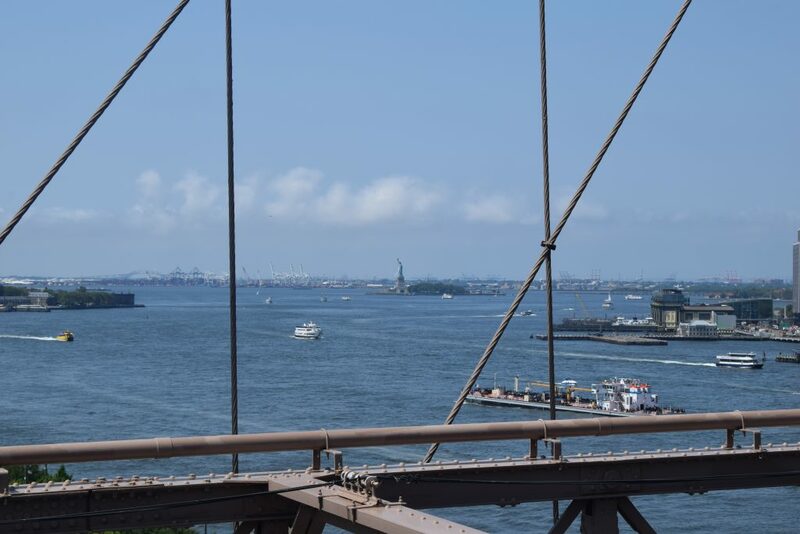 You can spot all the big ones – Empire State, the Chrysler, One World Trade and even the Statue of Liberty across the water. The walkways get busy, and you find yourself getting bustled along at some points. But take advantage of some of the places to stop, mainly under the main archways. Here the pathway widens, you can see down over the busy road below and there are interesting plaques to look at and spots to catch a little bit of shade whilst taking in the views. Treat yourselves – you did it! The kids especially need a treat to congratulate them for navigating through such a hectic walk. 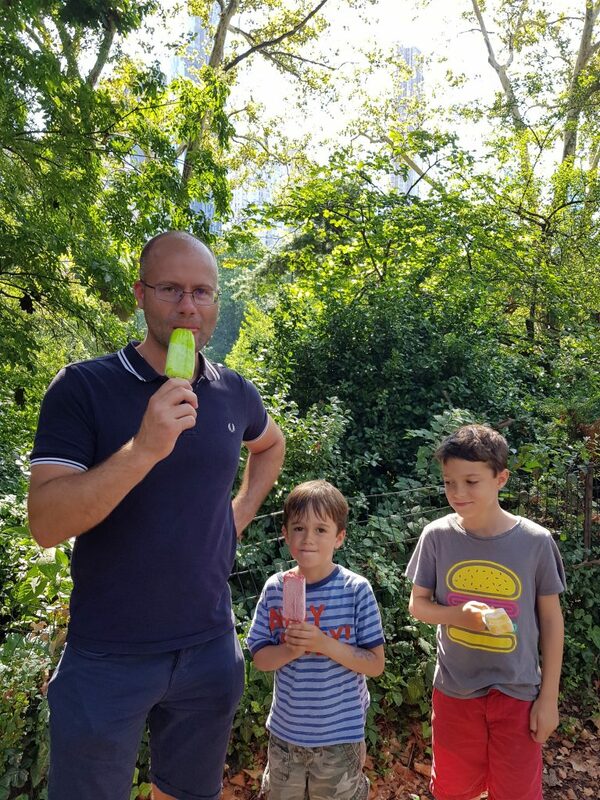 After a sit down and water break in the gardens of City Hall, we all had a fruit ice-lollies which went down a treat! 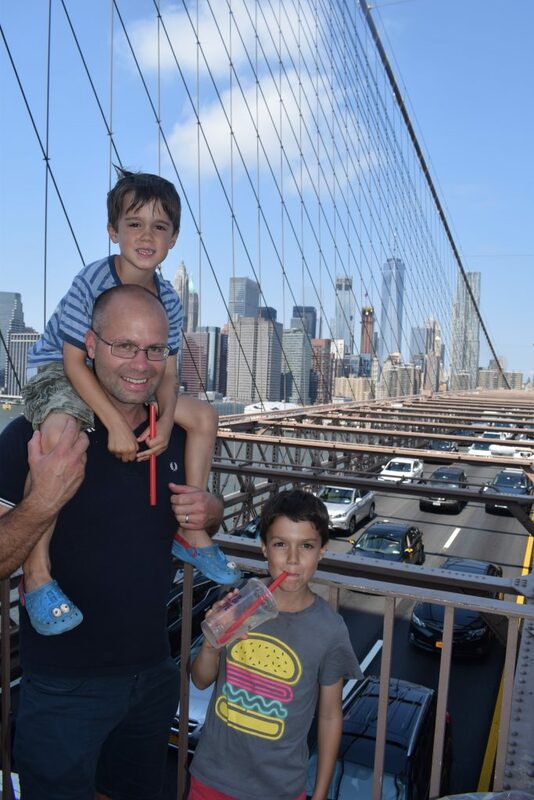 Have you ever walked the Brooklyn Bridge with Kids? Have you got any good tips too? I like the tip about having a play in the park at the beginning or end of the park. Something that would probably work well in lots of situations! What amazing views. 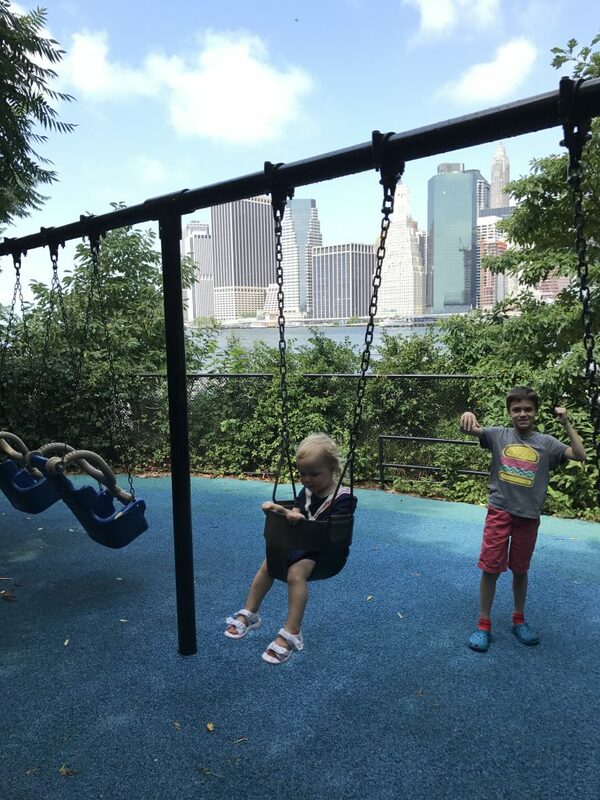 The views really were so amazing, and worked well at keeping the kids interested – as well as the playground and promise of ice lollies! I have visited a few times, but only ever walked over the Bridge once. That was in 1997 or something ridiculous! I need to go back soon with the children. 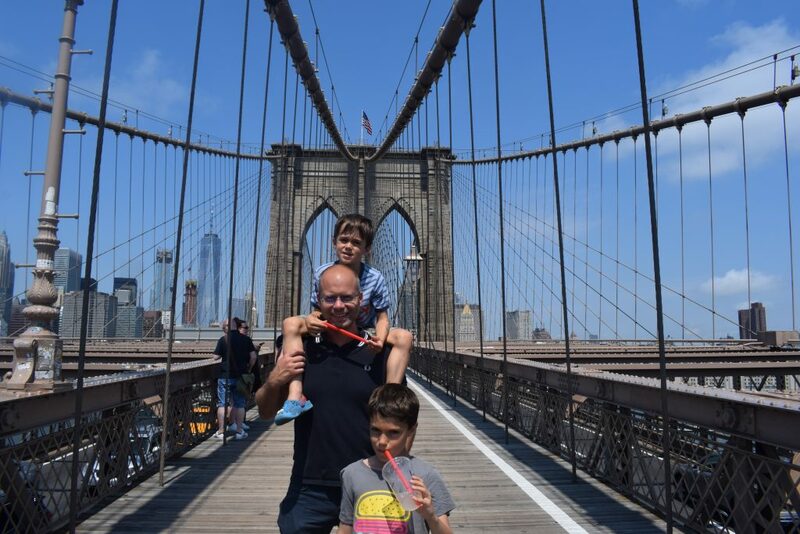 We went with them on Halloween one year, but it was too cold to venture out to walk over Brooklyn Bridge and now I really want to! Such a beautiful view. Love your pictures. Thanks so much for having me! I have to admit I would love to visit without kids too. Oh he would love it! We walked past the SOR theatre and I thought of you! A great excuse to head back to NYC! 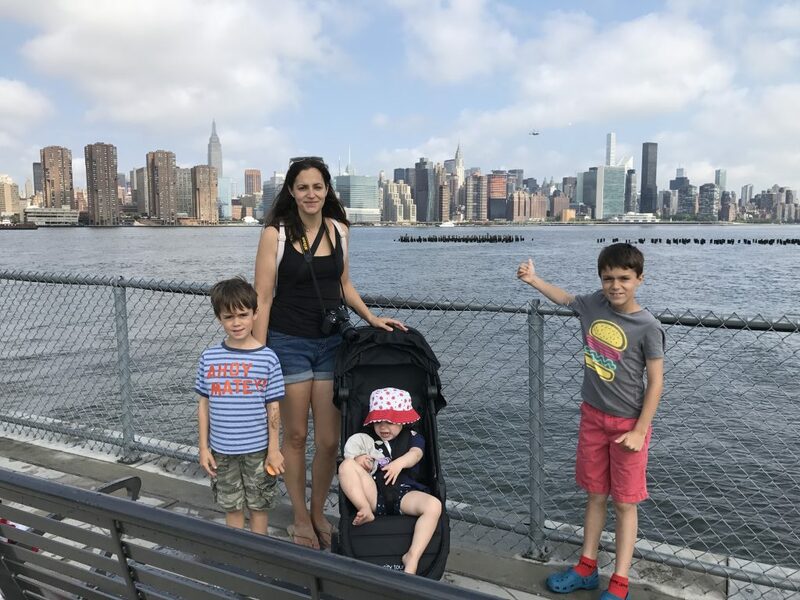 Welcome to Dais Like These Family Travel Blog! Hi! 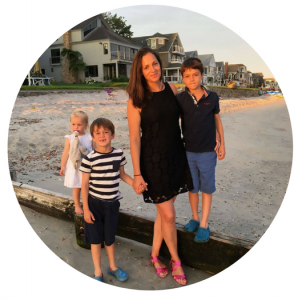 I’m Daisy, I am passionate about family travel and through this blog I aim to inspire other families to try new destinations with their kids. 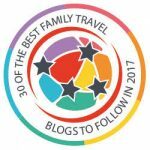 Here you will find lots of useful travel tips, guides and reviews which will help to inspire your own truly amazing family adventures! © Daisy Huntington and www.daislikethese.com, 2018. Unauthorized use and/or duplication of this material without express and written permission from this site’s author and/or owner is strictly prohibited. Excerpts and links may be used, provided that full and clear credit is given to Daisy Huntington and www.daislikethese.com with very clear, appropriate and specific direction to the original content.